← UEFA adopts code of conduct on match-fixing. Ha ha ha. (Sept. 26) – With a batting average of .321, Yuniesky Gourriel returned to Cuba from his stint in the Capitales de Québec, a team in the CanAm Independent League. The opportunity to play in Canada was a result of the flexibility in hiring provided by Cuba’s new baseball policy. Shortly after the start of the 54th National Baseball Series, the Industriales’ centerfielder appeared happy to return to his Cuban homeland after proving his worth in Canada in the previous two months. “I don’t expect to bat as I did in Canada, because I have seldom gone above .300 in the series,” he said. However, in the season’s opener, Yuniesky connected two hits — one of them a double — drove in two runs and made no errors. He seemed sure in his position and was cheered upon leaving the field at Latin American Stadium. A good beginning, no question about it. When he arrived in Quebec, the team was in the United States, playing CanAm league games, so he simply practiced during the first 10 days, after which he joined the roster. Did you have any problems with your documentation when you traveled to the U.S. to play with Les Capitales? None. I went to the U.S. Embassy and applied for a work visa to play in U.S. territory. Two days later, I received the permit and went in. I never had any problem with my documents. Because [CanAm] is an independent league not affiliated with U.S. baseball and because it was the Canadian government that gave me the permit to play, I never had any problems signing the contract, traveling or receiving payment. What was the most complicated aspect of playing there? Adapting to the system, because you’re on your own. Luckily, I was there with other Latinos who helped me a lot. But when it comes to playing, it is you against your errors. It’s difficult for us Cubans, because here [in Havana] we have a physical trainer, coaches, and in the hotel we don’t have to worry about the food. But things are different over there. I left the stadium and went home to take care of everything. Those conditions affect us the most, because nobody asks if you went to the gym, if you prepared or warmed up enough. They see only your style and your performance; on that basis, they decide if you’ll stay on the team or leave. Besides, in my case, the fact that I didn’t speak the [French] language well affected my communication with the rest of the team, even though the other players did everything they could — even speak a little Spanish — to make me feel better. Considering that players can rest only one day per month, was the constant play a physical burden for you? That’s another complex topic. In two months, I had only two days of rest; one was mandatory, the other was because of the All-Stars Game. In addition, there’s almost no reserves, because the roster of teams includes only 11 fielders and 10 pitchers, so any changes made are only for reasons of “force majeure,” such as injuries. I played all the games, until the team lost all chances to qualify. Then the director told me to rest in the last eight games. The physical load is very heavy there. Maybe that’s why the coaches look for versatile players. It was routine to see players rotating through different positions, as a way to freshen up. But you were always in the outfield. Yes, I played right field most of the time, because the centrefielder was the best player on the roster, with AAA league experience, who ended up batting .370. Besides, he spent several years with Les Capitales and has won several trophies with the team. This year, that player will leave the team. Part of the management’s strategy is for me to adapt to center field, so that I can replace him the next time I join the league. Beyond the frequency of games, did you need to make any other adjustments? Several. For instance, the quality of pitching is very good and, because the league has only four teams and the games are so frequent, your rivals get to know you exceedingly well. So, if you’re not doing well, you have to make the necessary adjustments in a very short time. Because the games are played daily, you don’t have time to recuperate and a slump can extend for eight or ten games in a row. As opposed to our National Series, where, after each subseries you have a day’s rest to analyze your mistakes and correct them. Does that put a psychological pressure on you? A big one. I had a very bad start and came to think that they’ll cancel my contract and send me back to Cuba. Besides, I had to make the adjustments by myself, not because of problems with the management but because I didn’t speak the language and that impaired my communication with my teammates. There was no one to whom I could ask what I was doing wrong at the time. Did Canada change you in any way? 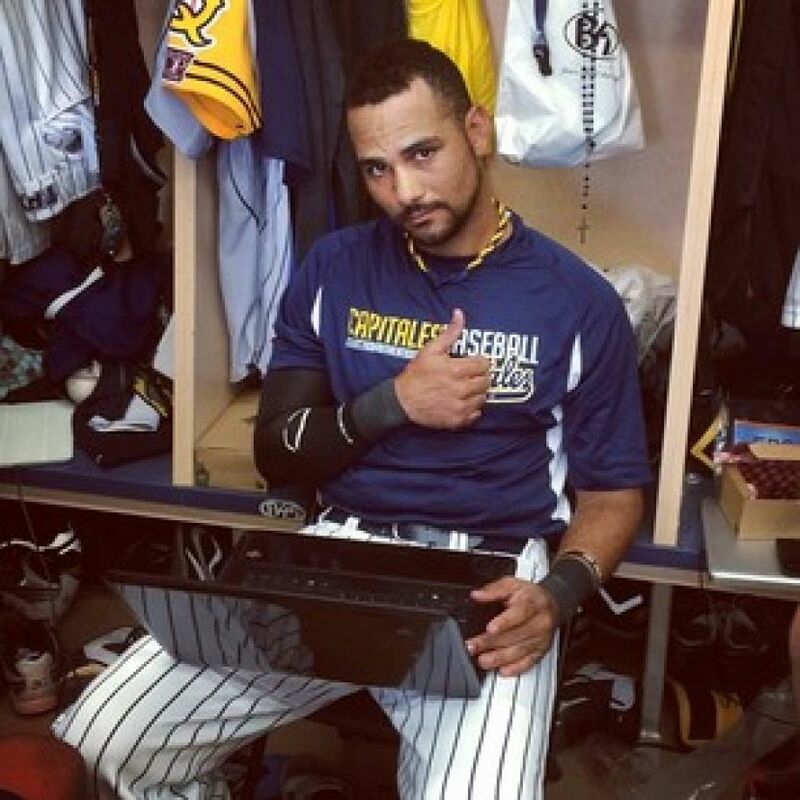 Playing with Les Capitales made me a better ball player and also a better person. That doesn’t mean that I will come to the National Series and have a .350 average, not even the .320 that I averaged in Canada, but [the experience] helped me get out of a rut I feared I might not overcome. It gave me a better reading of myself as a player. It also helped me to mature and be more responsible for my performance. It forced me to prepare myself and correct my own defects, to be more disciplined on the field. All that I plan to convey to my teammates here and support them, because now I understand the need for advice. Experiences are always important and I hope that I can somehow transmit them to other players so they may confront those situations better prepared than I was. You return after two months of constant activity, just before the start of the National Series. How do you feel physically for the new season? At present I feel very well. After I returned from Canada, I took a vacation and I’ve been training with Industriales for a week now. Now we’ll see what management decides, whether to put me on the team from the start or give me a couple of more days on the bench. I was very eager to return and join the team for the Series. After all, I’m here to play ball and if I have to do it tomorrow, well, I will. 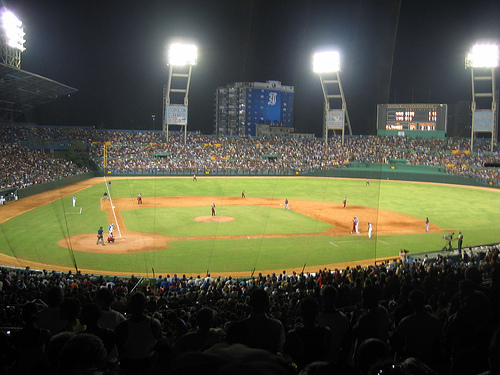 What’s it like to play in Latin American Stadium, wearing the Industriales jersey? It’s very simple, really, because the fans at the Latin American are among the most faithful and fanatical I know. They’re very demanding with their team. But their fidelity is something I always admired; to them, there are no better players than the Industriales. Now, playing against “the Blues” in a full stadium is very hard, and I can tell you this because I experienced it with Sancti Spiritus. But playing with the fans’ support is delicious.